Let us be your one stop shop for laser cut parts. At Supreme Manufacturing, we can cut your flat parts, tube parts, and 3D parts with our 4000W flat, tube, and 3D, 5-axis laser. We also provide welding, fabricating, and metal finishing services should you need them. Archiving of your program for later use. We can cut many different flat shapes with our laser. Look to Supreme Manufacturing for all your prototype and production work. We will provide you with quality, fair prices, and superior service. Our laser has a rotary air chuck that can cut tubing and pipe up to 12" in diameter. It also is capable of cutting angle, I-beam and channel. The laser can perform coping, notching, mitering, slotting, and drilling operations in one set up. 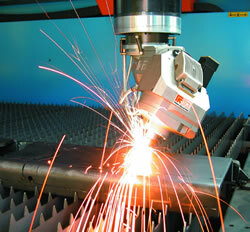 Five axis laser cutting is a solution when tooling costs become prohibitive. Our laser is a cost effective alternative to tooling. It has the ability to trim stamped parts, do prototype work, holes, or slots on a bend line. When you require burr-free short run parts, 5-axis laser cutting is the answer. Let us quote a part for you. We use Cenit 3D software to program our laser. We accept 2D AutoCAD, Solidworks, and Catia drawings. We also accept IGES and STP files.